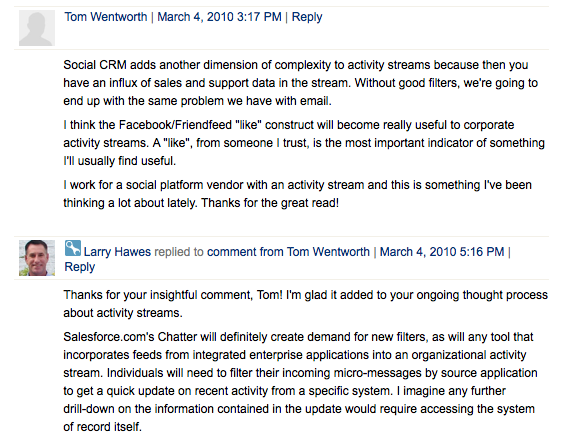 Filtering Microblogging and Activity Streams | Together, We Can! The use of microblogging and activity streams is maturing in the enterprise. This was demonstrated by recent announcements of enhancements to those components in two well-regarded enterprise social software suites. On February 18th, NewsGator announced a point release to its flagship Enterprise 2.0 offering, Social Sites 3.1. According to NewsGator, this release introduces the ability for individuals using Social Sites to direct specific microblogging posts and status updates to individuals, groups, and communities. Previously, all such messages were distributed to all followers of the individual poster and to the general activity stream of the organization. Social Sites 3.1 also introduced the ability for individuals to filter their activity streams using “standard and custom filters”. What other filters do individuals within organizations need to better direct microblogging posts and status updates to others, and to mine their activity streams? I can easily imagine use cases for location, time/date, and job title/role filters. What other filters would be useful to you in either targeting the dissemination of a micro-message or winnowing a rushing activity stream? One other important question that arises as the number of potential micro-messaging filters increases is what should be the default setting for views of outgoing and incoming messages? Should short bits of information be sent to everyone and activity streams show all organizational activity by default, so as to increase ambient awareness? Perhaps a job title/role filter should be the default, in order to maximize the focus and productivity of individuals? There is no single answer other than “it depends”, because each organization is different. What matters is that the decision is taken (and not overlooked) with specific corporate objectives in mind and that individuals are given the means to easily and intuitively change the default target of their social communications and the pre-set lens through which they view those of others. This entry was posted in Uncategorized and tagged activity, ambient, appliance, awareness, communication, community, corporate, default, dynamic, enterprise, Enterprise 2.0, feature, filter, functionality, group, individual, information, lens, market, message, micro-message, micro-messaging, microblogging, NewsGator, objective, organization, social, Social Sites, social software, Socialcast, Socialtext, status, stream, target, update, Yammer. Bookmark the permalink. Pingback: More on Microblogging: Evolution of the Enterprise Market « Together, We Can! Pingback: LinkedIn Signal Demonstrates The Power of Role-Based Activity Stream Filters | Together, We Can! Pingback: Filtering in Social Software: Protective Bubble v. Serendipitous Awareness | Together, We Can!